Gilt Restaurant NYC Security Cage for Dry Goods and Liquors, a photo by Gale's Industrial Supply on Flickr. Gale's Install Techs love working at first class restaurants, Gilt Restaurants east side location is first class in every way. And a great stop, afforable, Located just steps from St. Pats and Rockefeller Center. Restaurants, Hotels and Business have the need to secure their inventory and liquor. Gale's all welded galvanized steel panels and doors provide maximum protection. Backed with a Lifetime Warranty. 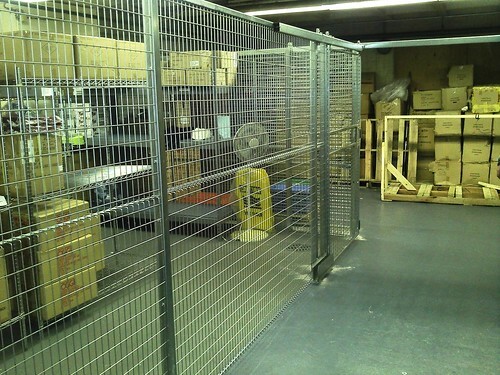 Gale's Security Cages and Tenant Storage lockers are maintenance free. Gales (est. 1938) provides free onsite layouts and cost effective solutions. Contact us today for immediate assistance. Labels: "woven wire partition 10017" "tenant storage lockers 10036" "apartment lockers" "sliding gates nyc" "hotel security nyc" "nyc real estate" "nyc property management"